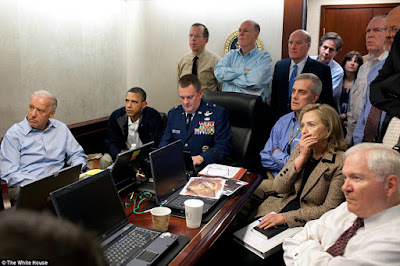 The leaders of the United States Military-Industrial Complex watch Usama Bin Laden's assassination from a remote camera attached to the helmet of a special forces soldier. On May 1st ("International Worker's Day" or May Day) on 5/01/11, nearly 116 months to the day after 9/11/01, the greatest straw man in the history of the world was found living in a palatial estate 800 yards from Pakistan's Military Academy. (Pakistan is a military junta with nuclear weapons to whom the United States has poured billions of dollars into since the start of the war on terror.) No picture was shown of his face or body which was allegedly dumped into the North Arabian Sea. He was allegedly thinly defended, yet he was not taken alive. If he would have been, there would have been no fair trial, just a military tribunal after months of torture. And they tell us the world we live in will now be a safer place. For me, this story is just as unbelievable as the story they told us 116 months ago: That 19 impoverished, mid-eastern terrorists destroyed the twin towers with hijacked commercial airplanes. Kamikazes in 1944 I can believe. 56 years later, I never bought the story they fed us on 9/11/01. But I believe what I can see around me. That the United States is a poorer and more disliked country since the start of the war on terrorism. We have created a fascist set of laws and a surveillance capacity unrivaled in modern times, yet we can not feed, house, or employ many of our citizens. And the rich continue to immobilize most of the nation's wealth. And if you had to create a pretext to develop a military, surveillance state capable of suppressing citizen dissent, capable of spying on all Americans, capable of silently dumping the working and middle classes into poverty while removing all possible avenues of a revolution against the monied elite who have sucked the wealth out of this country.... How would you do it? What lies would you feed the people?